or purchased and used for various Bible lessons. 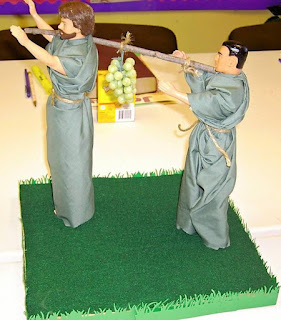 I saw this at the Teacher's Bible Class Workshop, but didn't get a picture of it. I didn't spend a lot time making it perfect, since I might not ever use it. But, it is a great idea if you teach Old Testament. 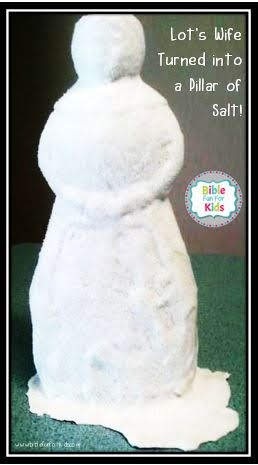 Genesis 19:12-26 is Lot's wife being turned into a pillar of salt for looking back. This is a Mrs. Butterworth's container. I (my husband) sawed off the top and I rubbed sandpaper over it to make it tacky. I used 'Pottery Plaster' from Hobby Lobby and covered her all over. Once it dried, I spread my Aleene's Tacky Glue all over and poured on the salt. You can plug the hole on top and finish it with the plaster, or you can use fabric to make a headpiece to cover the hole. 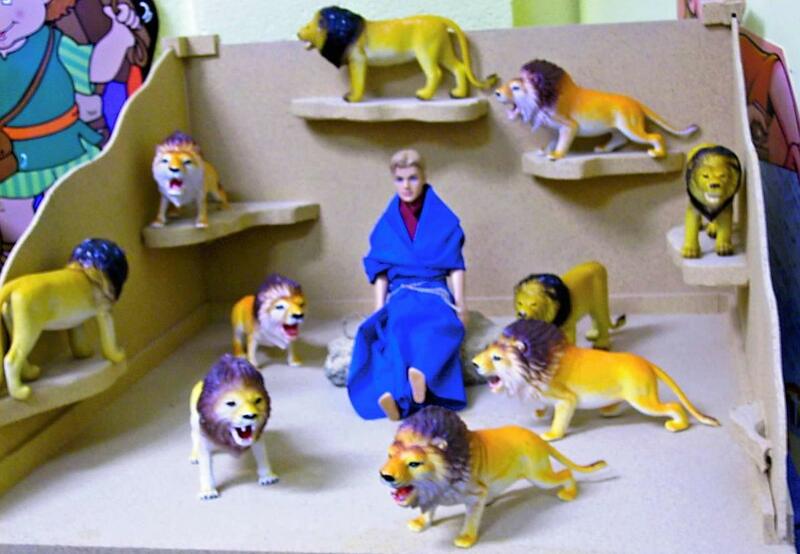 This Daniel in the Lion's Den was made by my husband. It is about 24x24, 12 " along the back. We sprayed painted the inside with that sand spray so it has texture. The sides and back come out of the slotted edges to store better for me. The back is about 12 inches tall. The lions were at Target Dollar Spot (Yah! Always look, you never know what you will find!) 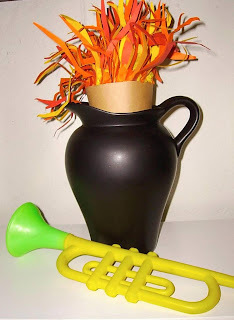 The kids LOVE this! 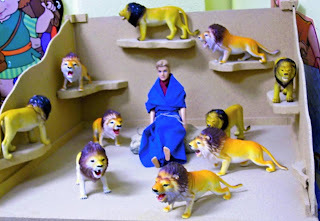 let them touch, move the lions around, what is the point if they can't enjoy it? Here is the Daniel lesson. The preschool lesson is here. You can see more visuals from VBS here. Obviously, Joshua and Caleb with their huge clusters of grapes from the land of Canaan. (Numbers 13) I like to seat the kids in a giant rectangle with tables in the middle. We can push stuff out of the way, and I put the visual aids right in the center where everyone can see them. My class is too large now (that is a great problem) so I put the visuals on a table in front, behind me. They are standing on a block of wood with felt on top of it. This is my boat my husband made for me. You will see it in several Paul displays. For Jonah, I found this fish at Dollar Tree (They still have them) and a smaller man. 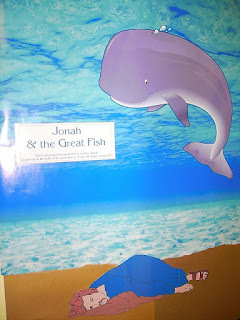 I wrapped some cloth around Jonah, and there he is being swallowed up by the Great Fish created by God. The Bible doesn't say a whale. Jonah 1:17. We know God can do anything, and He CREATED a fish just for Jonah. 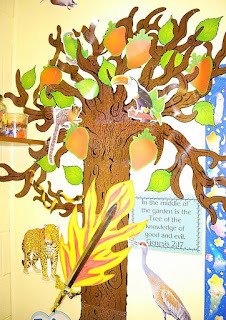 Next is a bulletin board that went with this Bible lesson. There is a lot of information, visuals, song, etc. on this Jonah post here with another Jonah lesson here. 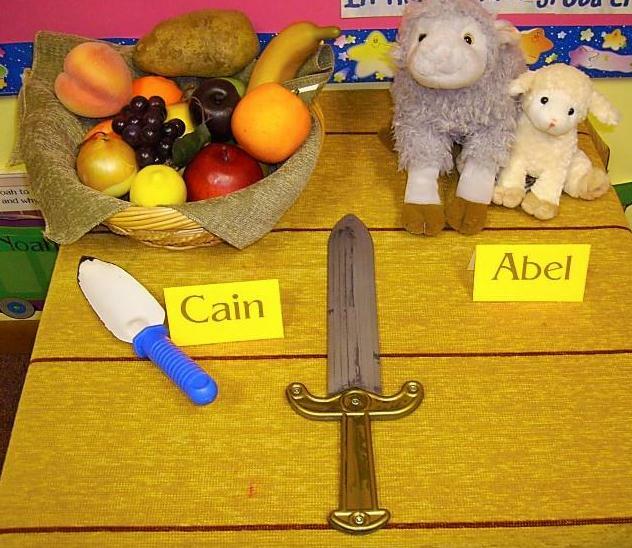 You can find a preschool lesson on Jonah here. 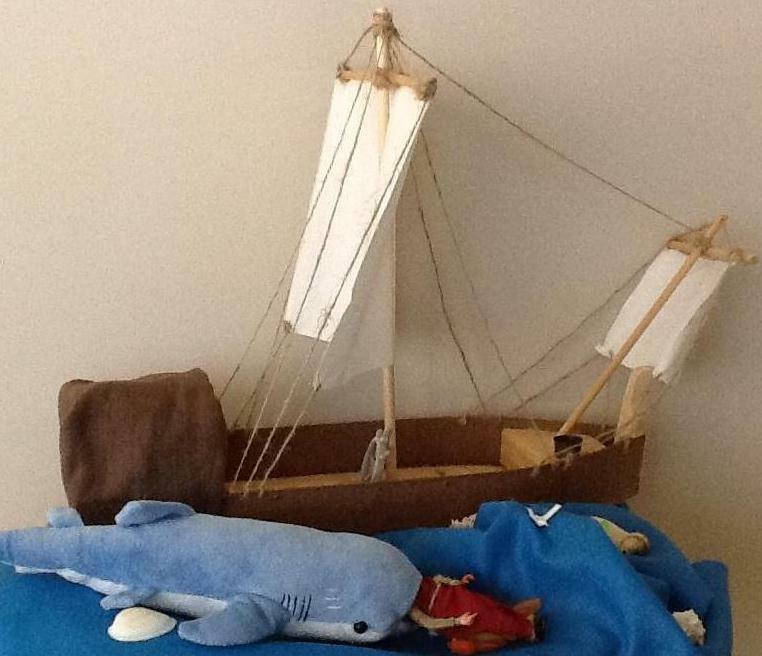 My husband also made Noah's Ark for me. It is really close to scale. If you look at the top of the ark, there is a train car. That is for the kids to be able to possibly comprehend the size. One door, one window. Genesis 6:16 The trees and animals are also pretty close to scale. Added notes for this: The train car, the trees and the animals are N Scale train pieces. Hobby Lobby carries them or your local hobby store that carries train supplies. Also, look for N Scale on Ebay or Amazon. I just used green felt for the 'grass' and moss to add the extra texture. You can find the moss at Dollar Tree (or where you shop) in the floral department. Solomon. 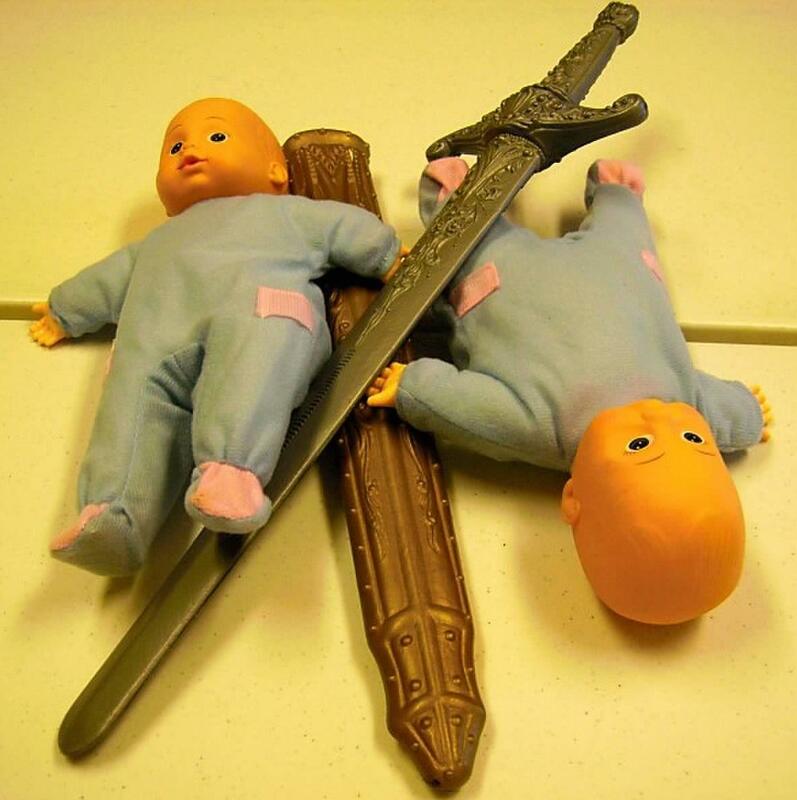 These (boy) babies are at Dollar Tree. We acted out this lesson, the boys love the swords, and now is the time to get them with the Halloween costumes at the store. Solomon is here. You can see the preschool lesson here. The Tree of Life with the flaming sword. It has FRUIT on the tree. Genesis 3:6 Moses tells us that Eve ate the fruit, it doesn't say apple. Another use for those costume swords! You can find more here. 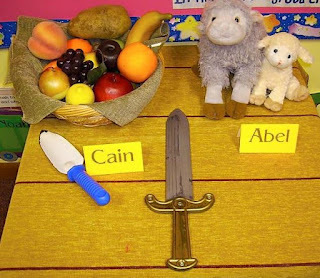 You can see more for Cain & Abel here. 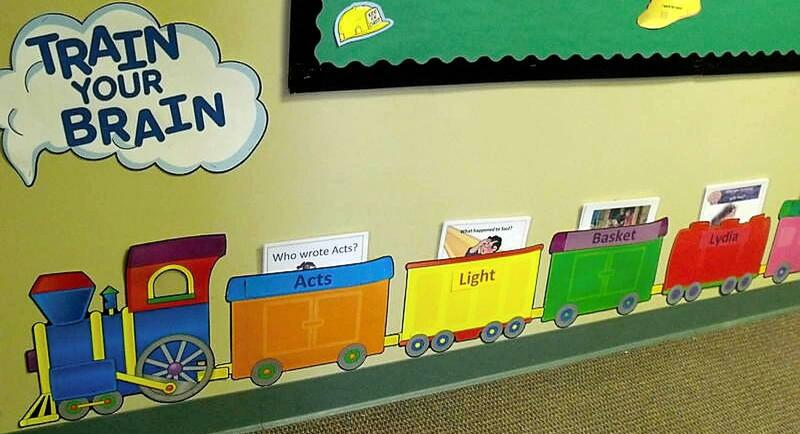 Here is the same train and it is used for the book of Acts. 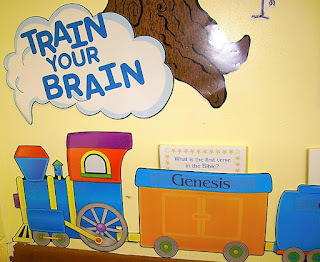 You can find more information and how-to for the train here. Hi! I saw this at a Teachers Workshop I went to, and made her just for the picture. I mostly teach New Testament right now, so I made her good enough to take the picture and let people see the idea. I planned, if I ever used it, to add a head scarf covering thingie and cover it that way. My hole is still open! I contacted the person and she said she filled hers with the plaster, then rounded off the top. Please, if you figure a different way, let me know, and I will post it, with picture and credit to you. That would be appreciated! Another idea, after my contacts answered me, is my niece is going to buy a salt block and carve out a head and make hers that way. I really don't see why you couldn't paint it, but I roughed mine up with sand paper first, and that would help with paint, I think. If you can, post a message for others letting us know if the paint works! Thanks! I would like to get more information on the Train. Love the idea!! Thanks for visiting! Here is the link with how I used it for Acts and more info on the train. Sorry, I should have added this link before! I am speechless with the cool & awesome stuff I see here! !